The crisis in Ukraine deepened following clashes between pro-Russian separatists and armed forces despatched to the east of the country by the new Kiev regime. In response, Russia ordered new military exercises on its border with Ukraine. At the same time, US troops were deployed in Poland for military exercises. This is in accord with the US announcement that it will send paratrooper units to Poland, Estonia, Latvia and Lithuania. American warships are in the Black Sea. Following two recent visits to Kiev by CIA director John Brennan and US Vice President Joe Biden, the Kiev regime made aggressive military threats against the east. Given the highly combustible situation in Ukraine, the military build-up by the western powers and Russia is very dangerous. Putin has amassed armed forces on Russia’s border with Ukraine and said he will act to defend ethnic Russians. Events could spiral towards a full scale conflict in Ukraine between Russia and Ukraine. The biggest losers in this horrific scenario would be the working class of Ukraine and across the region, whatever their ethnic background. 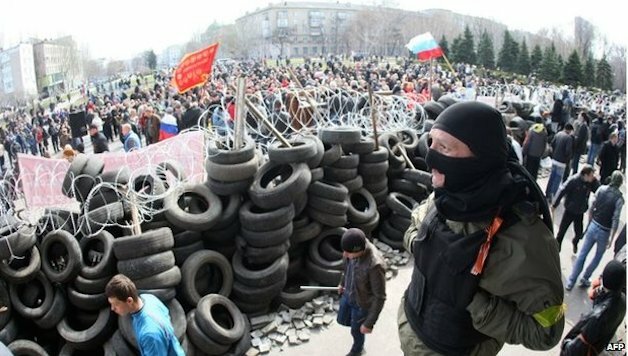 Following the breakaway referendum in Crimea, on 16 April, pro-Russian supporters seized police and security buildings in Donetsk, Kharkiv and Luhansk, the three capitals of Ukraine’s eastern provinces. The same pattern was seen on 12 April when police and security buildings in ten or more towns and cities across eastern Ukraine fell to pro-Russian rebels. The Kiev regime and its western backers allege that Russia whipped up fears in the east and staged the seizures. Unidentified, well-equipped special forces did appear to take a lead in occupying the buildings, and demonstrations in support where relatively small. But reports of many police officers switching sides and the formation of local separatist militias indicate the widespread antipathy of Russian-speakers towards the Kiev regime. This is hardly surprising given the thoroughly reactionary character of the Kiev regime and the way in which it came to power. Months of mass protests in Kiev ignited last year when the Victor Yanukovych regime ditched a deal with the EU in favour of making one with Russia. Yanukovych backed off when he realised the scale of the austerity cuts that the EU and IMF demanded would be introduced as part of its financial aid package and correctly feared a revolt of Ukraine workers. Although many on Independence Square in Kiev had illusions in the EU, the protests were mainly fuelled by years of economic stagnation and poverty under the authoritarian, corrupt Yanukovych regime and its oligarch backers. This revolt, which had some characteristics of a revolution, quickly laid bare the very narrow base of support for Yanukovych and the hostility to the oligarchs. When Yanukovych’s riot police brutally attacked protesters it only created more revulsion and isolated his regime. Powerful workers’ organisations and parties could have led mass struggles against Yanukovych by making a class appeal to all workers in Ukraine to oppose the reactionary politicians and oligarchs and to fight for a socialist alternative. But in the absence of such class forces, reactionary opposition politicians, including Ukrainian ultra-nationalists and the far right, dominated the protest movement. The anti-Semitic Svoboda party and fascistic Right Sector acted as muscle on the streets of central Kiev and elsewhere, aiding the coming to power of the Arseniy Yatsenyuk-led regime on 22 February. The opposition were backed by the US and European powers, which have long had designs on gaining more influence and control in Ukraine. They want a pliant, pro-western regime in Kiev that will facilitate the further penetration of western big capital into Ukraine and the region. These powers want an acquiescent Ukraine, along with the continuing eastwards expansion of Nato to counter their Russian rival. But the western powers stoked-up more than they bargained for. The incorporation of sections of the anti-Russian far right in the regime only inflamed ethnic tensions, deepening fears of discrimination among the Russian-speaking minority, particularly in the east and south. The referendum in Crimea, held on 16 March, saw a huge vote for union with Russia despite the oppressive conditions under which it was held. The heavily industrialised east would lose out the most from any new trade deals the Kiev regime makes with the EU and IMF, ruining their local economy, as well as bringing austerity misery onto the heads of working people across the whole country. This month’s occupations of police and security centres in the east shows the growing gulf between Russian speakers and the Kiev regime and how little authority the Ukraine government has in the east. Around 2,000 coal miners in the Luhansk area outside Donesk reportedly went on strike in protest at the Kiev government’s 10% salary levy to fund restoring central Kiev following the street fighting earlier this year. The country’s ‘acting president’, Oleksandr Turchinov, set deadlines to take back the buildings but with little effect, so far. To Kiev’s great humiliation, armoured personnel carriers containing Ukrainian troops were commandeered by civilians at Sloviansk. A “breakthrough” deal between the US and EU and Russia to supposedly de-escalate the crisis by ending all occupations and ‘illegal’ militias quickly fell apart in mutual recriminations. There is a staggering degree of hypocrisy involved here, given the decades of US and western imperialist invasions and occupations of other countries, not least Iraq and Afghanistan, and Russia’s brutal military incursions into Chechnya. Turchinov soon ordered an “anti-terrorist operation” involving Ukrainian troops and aircraft and, provocatively, armed thugs from the Right Sector. It is possible that the pro-Russian forces will continue to grab power in the east, creating “parallel governmental structures”, with Moscow’s support. This would, in effect, mark the cantonisation of Ukraine, with the ominous danger of ethnic population expulsions taking place on both sides. But the recent clashes show the situation could get even worse, spiralling into a civil war and direct bloody conflict between Ukraine and Russian armed forces. Events may lead to Putin deciding to take military action in Ukraine. Russian government spokespeople warn that the Western powers’ bellicose actions are a direct threat to Russia’s vital interests that might trigger military invasion. By comparison with the Russian army, the Ukrainian armed forces are weak and poorly equipped and its personnel in the east and south could defect. But such Russian action would come with great risks and at a considerable cost, both militarily and economically. 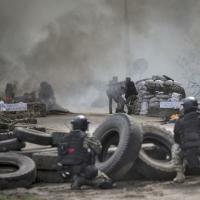 Russian forces could get bogged down and face attacks from Ukrainian nationalist militias. To bring wages and pensions up to Russian levels for Donetsk alone, for example, would cost twice as much as for Crimea, leaving aside the cost of subsidising the region’s coal mines. This is something that Putin can ill afford given Russia’s stagnant economy. The vast majority of the working class of Ukraine do not want to be dragged into a wider conflict and ethnic division. Their class interests are completely opposite to those of the local reactionary politicians, oligarchs and outside powers, who are bringing Ukraine towards catastrophe. But fear and passive opposition alone will not stop wider conflict. Only the organised working class can stop more bloodshed, deepening ethnic divisions and falling living standards. With around half a million miners alone, the working class is potentially the greatest power in Ukraine. To actualise their potential, workers require independent organisations, such as cross-ethnic defence committees, trade unions and a mass party that opposes all pro-capitalist parties and imperialism, guarantees full minority rights and presents a socialist alternative. Building these forces in the current circumstances is very difficult but this task remains the only way out of the nightmare wrought by capitalism and imperialism.